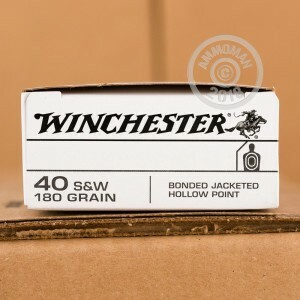 For a powerful self-defense ammunition, choose this 40 S&W Bonded JHP round by Winchester! 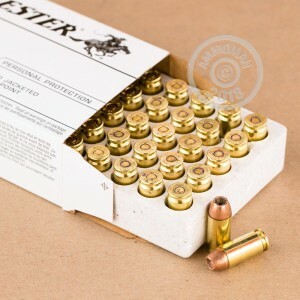 This high performance ammunition features a jacketed hollow point bullet that is designed to expand immediately after penetrating its target, providing maximum stopping power. It has a bonded core, which helps the projectile stay in one piece, further aiding its stopping power. These cartridges are brand new with non-corrosive brass casing and boxer primers. Reloaders will be happy to know this product can be reloaded. Law enforcement and self defense experts agree that carrying a quality JHP round in your self-defense handgun is the best thing you can do to protect yourself. Produced by one of the leading ammunition companies in the industry, this is one of the best rounds you can buy, and its American made! 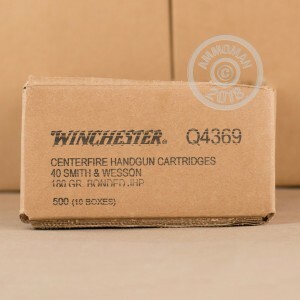 Order your box of this excellent ammo, and be ready for the day you hope will never come.